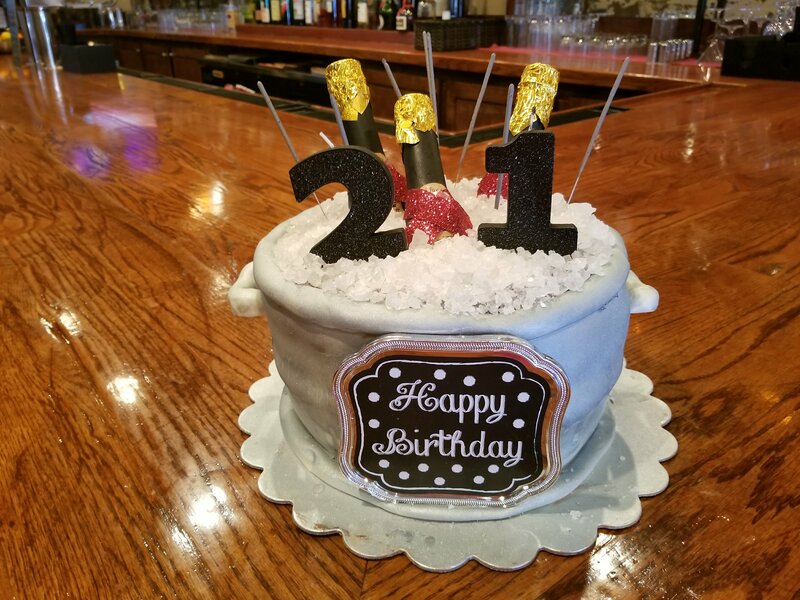 Home / Kitchen Fun / 21st Birthday Cake! 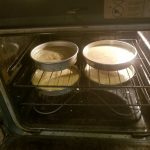 by Momleficentupdated on September 5, 2018 March 20, 2018 Leave a Comment on 21st Birthday Cake! Well, it’s official, I’m old. 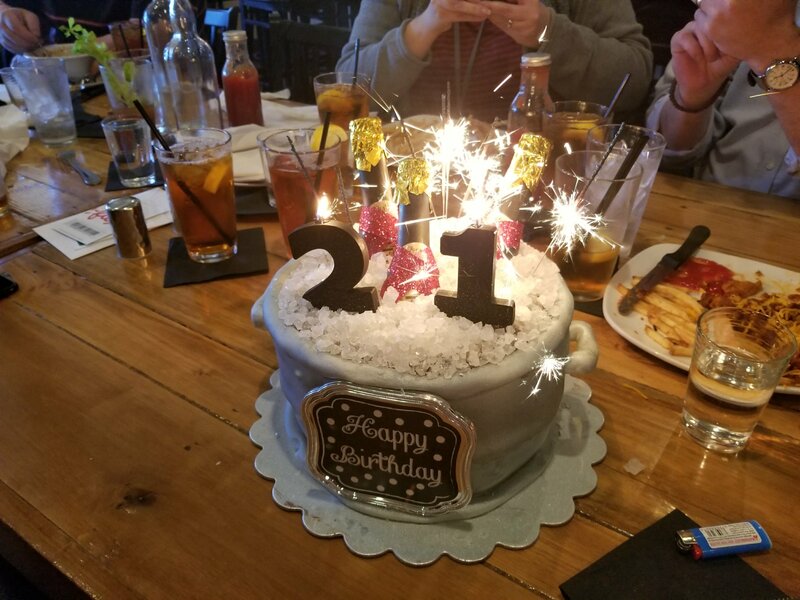 My darling niece just turned 21! I had the privilege of making her birthday cake. I can’t tell you how good it did my heart to have her ask me to make it rather than a professional. She has been my little side kick since she was born – I refer her to her as my first born even though she’s my brother’s child. I can’t believe she is an adult! I will always see her as the precocious little four-year-old in overalls and bare feet with a sassy streak a mile wide. For the record, she still has the same size sassy streak! This cake had to be special. She wanted something chic but fun, something that reflected her milestone and her personality. 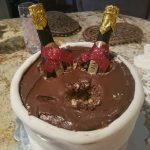 We settled on a cake in the shape of an ice bucket with champagne bottles on ice in the bucket. How fun! 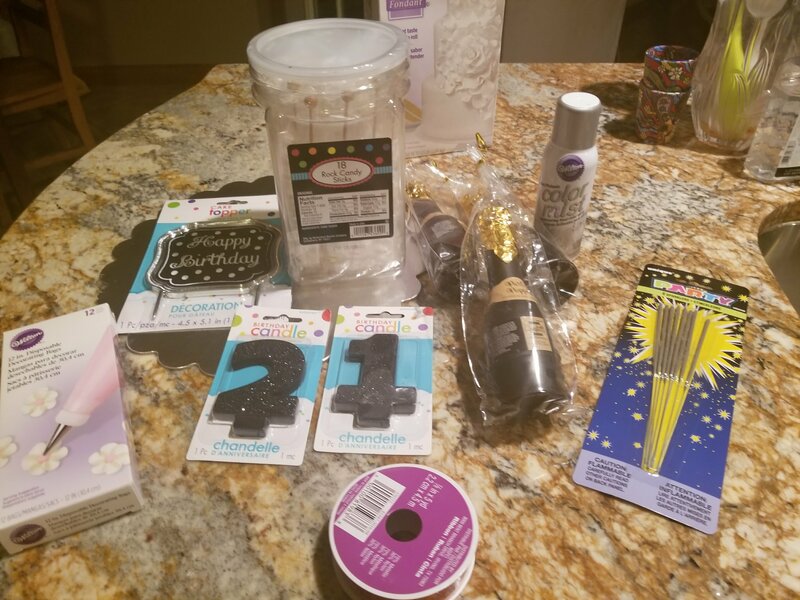 Materials were easy to find between my local grocer and party store, but amazon would have them all as well. 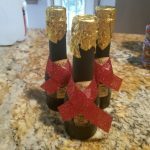 Instead of real champagne bottles, I used party poppers in the shape of champagne bottles because of the weight. The cake layers are made of traditional vanilla pound cake (recipe is below) with chocolate icing and a covering of white fondant. Truthfully, I absolutely hate the taste of fondant. I could go the rest of my life and not eat fondant. That being said, I use it a lot when decorating cakes so that I achieve a particular look and feel for each design. There is only so much you can do with cake tips and butter cream. 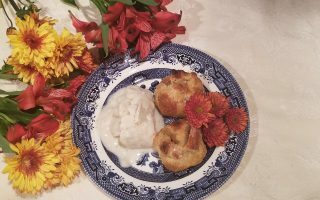 Cream softened butter and sugar. Add vanilla, salt, eggs, then dry ingredients. 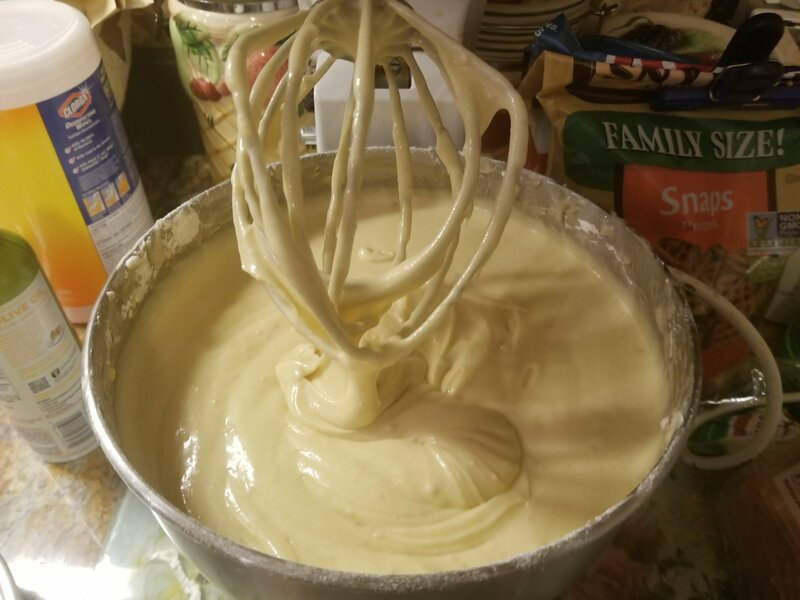 Bake for 90 minutes at 350 degrees if you are using a well greased Bundt pan or about 30 minutes if you are baking in layers like I did. 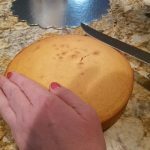 The recipe above made four layers – but you may want to halve it if you are making a single cake. Once the layers are done, remove from pans and let cool. Level the layers prior to stacking and icing. To decorate the cake, begin with your bottom leveled layer. Brush with an apricot glaze (6 tablespoons apricot jelly thinned by warm water to a brushable consistency) to keep the layers moist. Ice with a generous amount of icing. 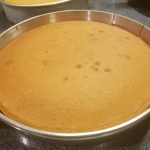 For this recipe, I used a canned milk chocolate icing – it took about 4 tubs for this cake. Continue until you have all four layers stacked and generously iced. Roll out your fondant (I use Wilton brand pre made) to about a ¼ inch thickness. Measure the cake layers by wrapping a ribbon or string around your pan until it touches, but doesn’t overlap. 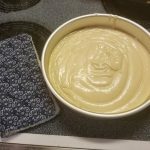 This will help you roll the fondant to the appropriate size. 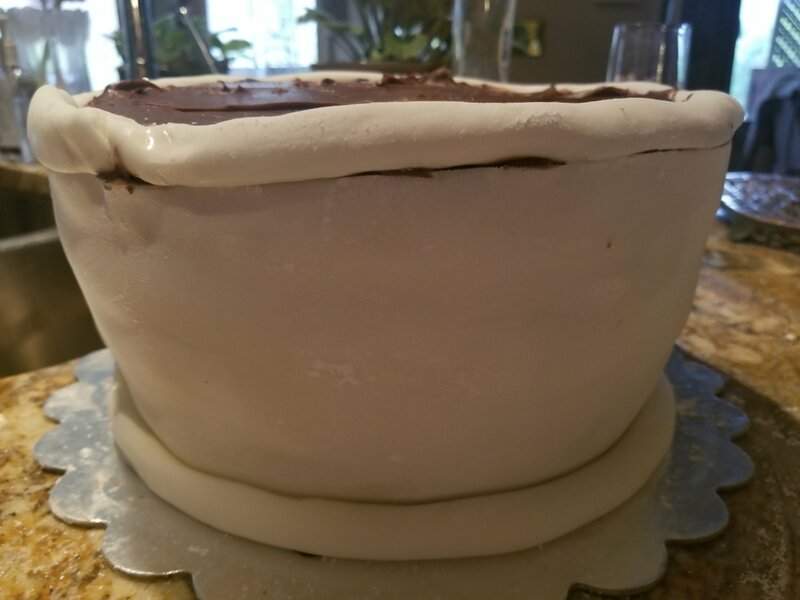 Cut your fondant into a large rectangle that will wrap around the sides of your cake and slightly overlap. Use powdered sugar to keep the fondant from sticking to your rolling pin or counter. Roll the fondant up (like a premade pizza crust just out of the tube). 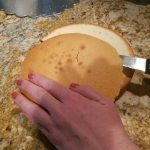 Start at the back of your cake (every cake has a back – mine was the “lumpy” side) and gently unroll the rectangle around the sides of the cake. Brush a bit of the glaze or plain water along the seam to join. 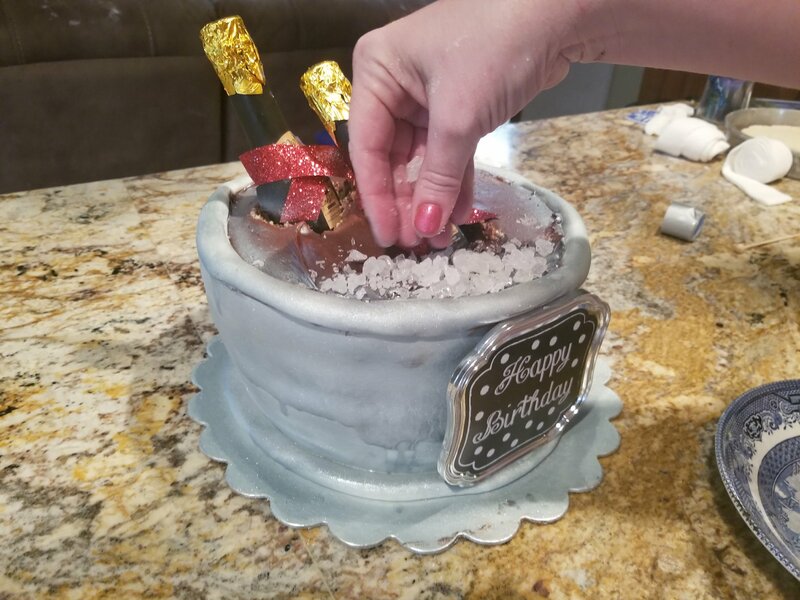 Using the additional fondant your rolled out, roll two long ropes for the top and bottom edges of your ice bucket. Attach these using water as well. 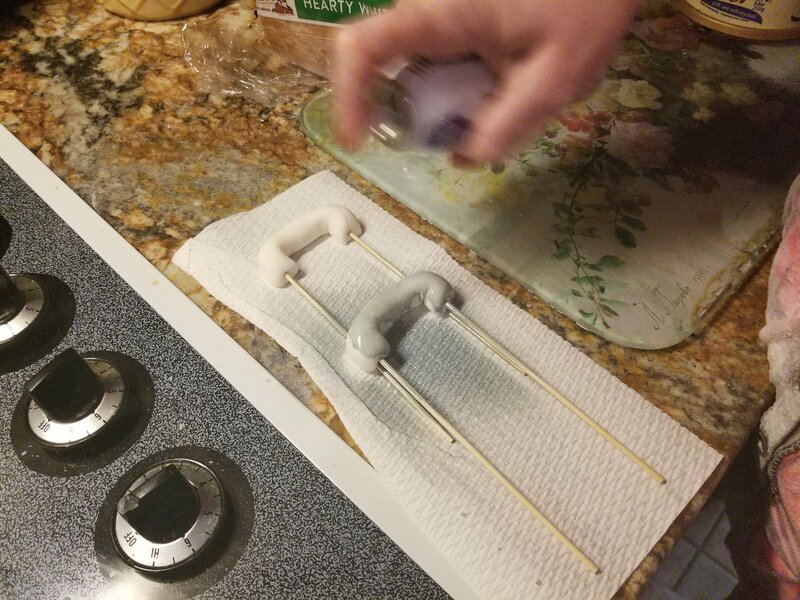 I made two handles for the bucket by rolling two 3 inch coils, inserting mini skewers and bending the edges so that it would dry in a “U” shape with a flat bottom. Don’t forget to spray those as well. Let them dry overnight so that it will harden then insert into the layers using the skewers to keep them in place. To color the bucket portion, I used a silver color mist from the baking section of my local craft store. It is basically edible spray paint, so have fun with the colors and textures. I think using a black base with a silver overlay would have helped the “ice” to pop a bit more – live and learn. It only took me one can of color mist, but it took every last puff in that can. Just like spray paint, don’t hold it too close or concentrate in one spot too long or it will run and drip. 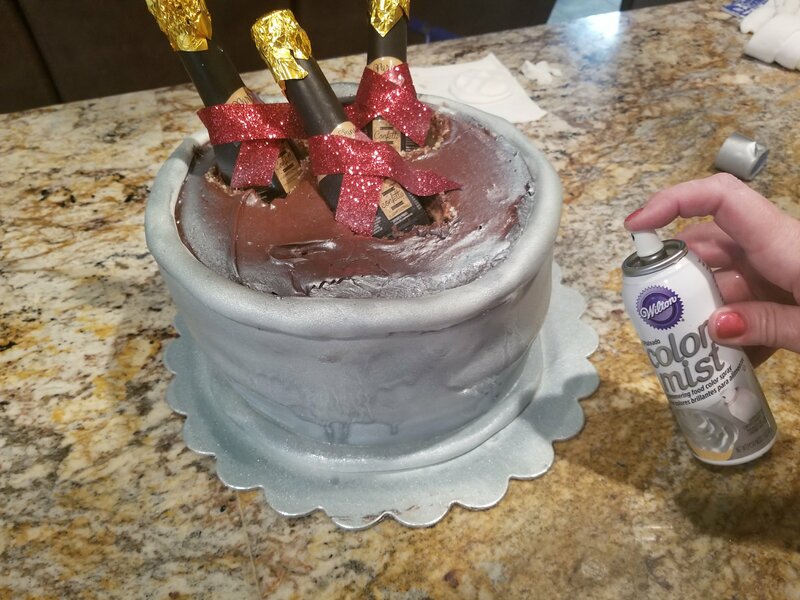 Don’t worry about any spray getting onto your icing, it will be covered with your ice. I added red ribbon to the bottle necks of each party popper bottle to add some color to the cake. To insert the bottles, I simply used a spoon to hollow out three holes in the top of the cake for the bottles to sit. I inserted the bottles and began to apply the “ice.” There are a couple of methods for this. If you want ice cubes, you can use glacier mints. I had a really hard time finding these, so you may want to order from Amazon if you want the cubed look. If you wanted a crushed ice look like I did, you can use rock candy lolly pops. I bought a bulk container from my local party supply store. 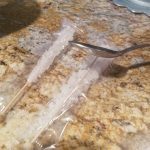 I simply took the wrapped candies and tapped them with the back of a spoon until the rock candy came away from the stick. Instant crushed ice. 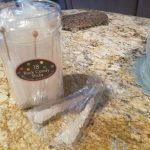 Sprinkle the ice liberally on the top and around the bottles until you have a mounded look. Adorable! I used two black numbered candles and sparkler candles for pizzaz. I finished the front with a little birthday plaque, but you could easily add fondant or icing numbers or a name. It was beautiful all lit up! Previous ArticleSt. 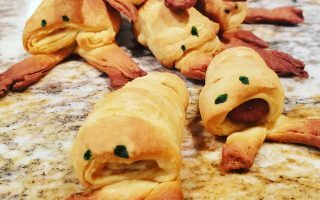 Patrick's Day Theme Night!